Irene, I always adore your fabulous, romantic pieces 💟 you never disappoint! You’re choker has olde world charm and timeless appeal. Brava! Thank you so much. 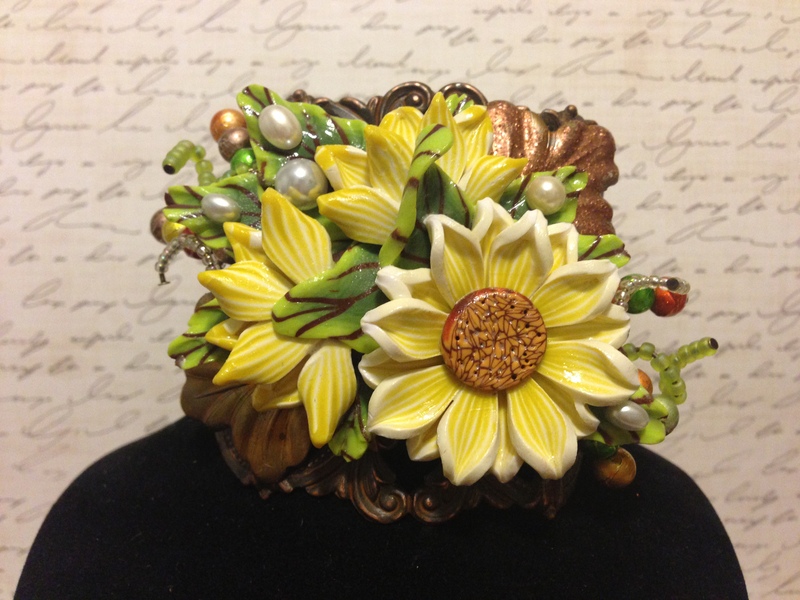 I love making jewelry in this style. It just speaks to me. I LOVE this piece! So classic in design! Everything you make is great! Irene, your creation is just beautiful. I love it. 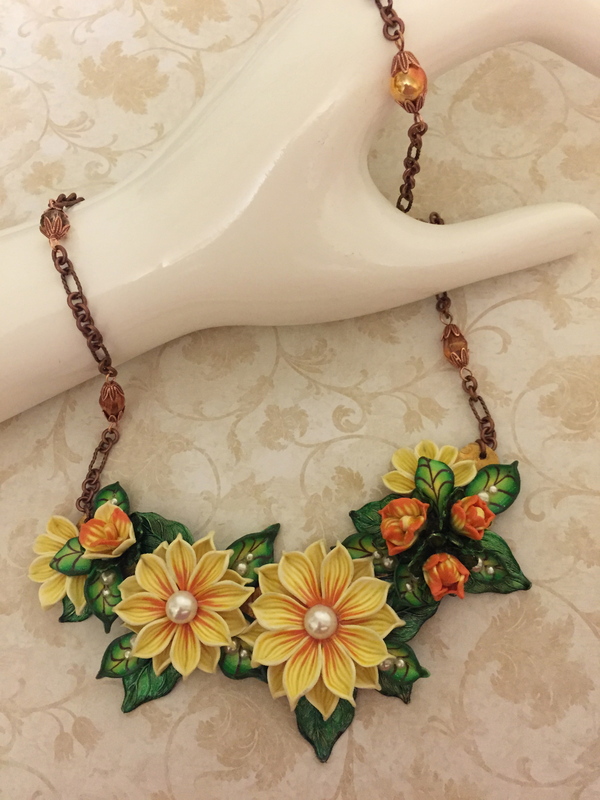 The polymer clay designs are some of the most unique and wonderful that I have seen. Beautiful , my friend. 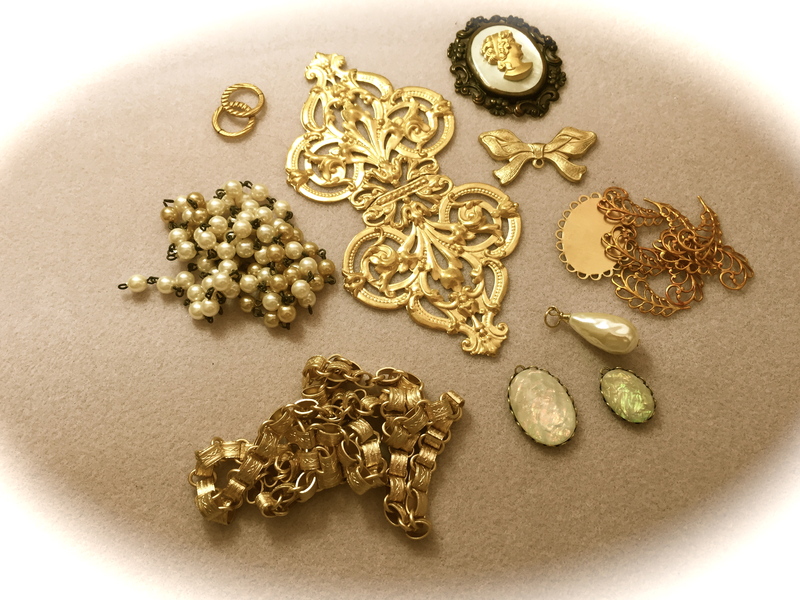 Enjoyed reading your blog, both the personal side and about the lovely jewelry. Thank you Janet. Means a lot. 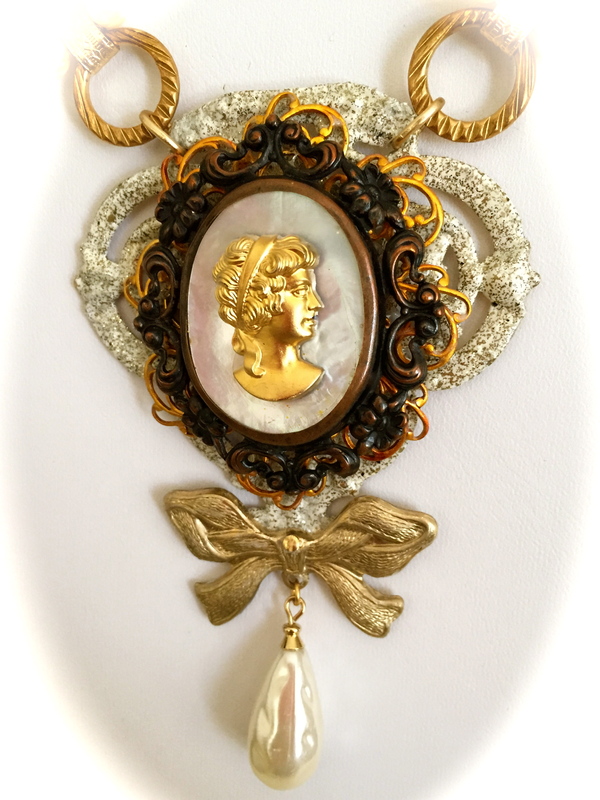 Your Cameo piece, has all the great elements of Vintage Flair. I just love it! Thank you so much Mary Beth. I love working with cameos and dressing them in style. I certainly have enough components to do that. Glad you’re back! This necklace is just awesome and the chain is so lovely! Beautiful hop entry. 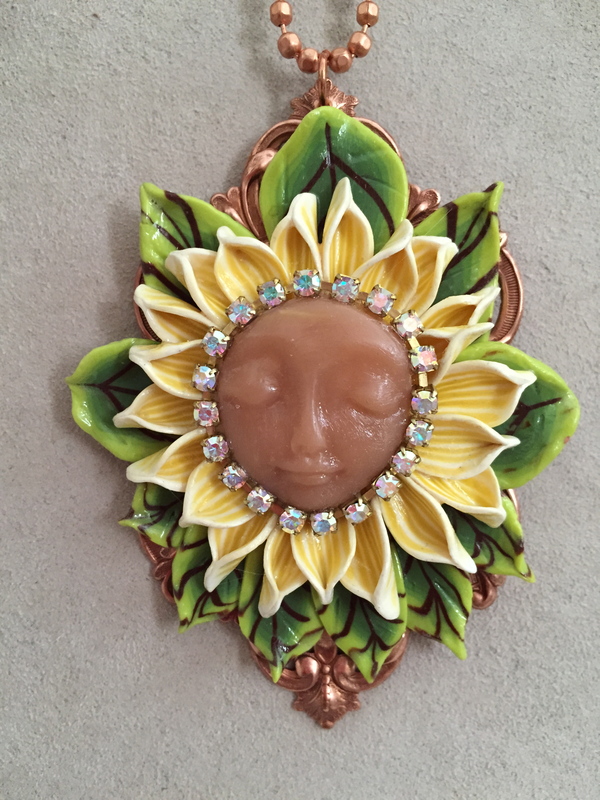 I love your polymer clay piecesalso. Irene, oh my goodness, I am truly in awe of your challenge piece. It is gorgeous. I love the colors–they are subtle and elegant–and the neck treatment is the perfect, perfect, perfect finish! I adore it! Great blog post, too. I can relate to the juggling act we do. And again, congratulations on a truly beautiful piece. It is a work of art! Thank you Ingrid. I love beading with the book chain. Always a beautiful finish. LOVE what you did with the bookchain, this is just perfect….so fluid and finished. 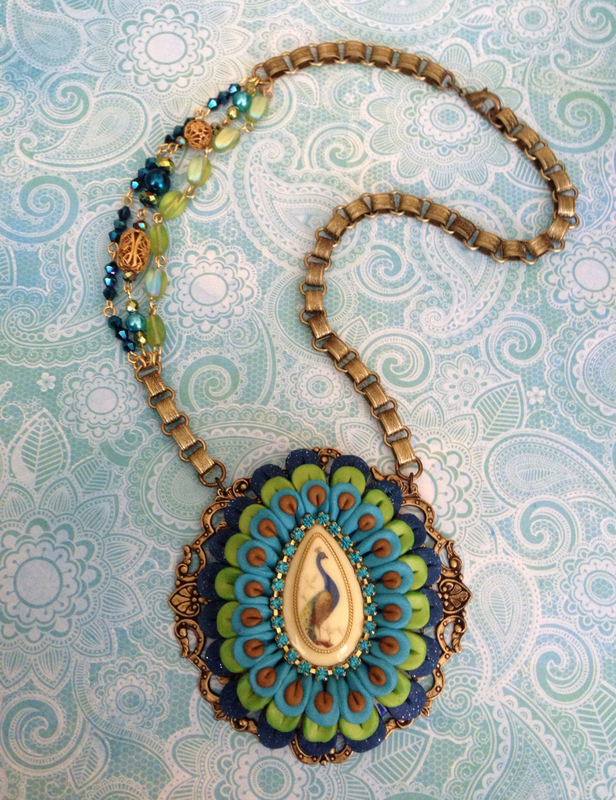 Gorgeous work, Irene….as always. So glad you were able to join us this time, never the same without you. Thanks so much Brenda. You know how I love beading with that bookchain. Look forward to our next hop. I love what you did with the bookchain. I am thinking I may try that sometime, my way of course, but I really like yours, its inspiring. Thank you Shari. Please do try your hand at beading with the bookchain. You will love it. Your flowers are beautiful. Really lovely work!!! Oh my goodness Alexandra, thank you so much. It makes a really beautiful and fluid necklace/bracelet. Maybe I’ll do a tutorial one day, but I would be more than happy to share the design with you. Muchisimas gracias Cynthia. I’ll do that beaded chain all day I enjoy it so much. I meant to say, PM me if you’d like to share the chain technique. But you might not want to because I would eventually use it on pieces in my shop, so I’d understand if you didn’t!! Many many thanks on both compliments Belinda. Renie .. 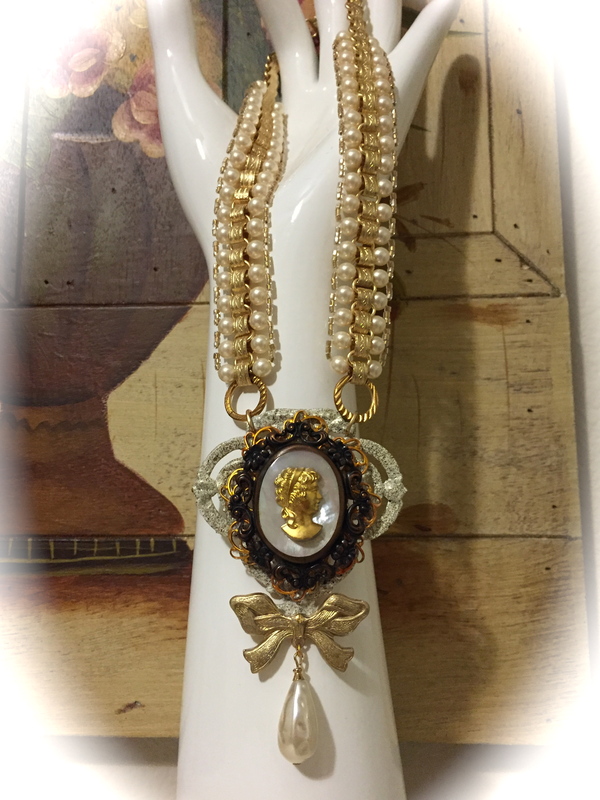 I love your necklace what a statment piece .. the chain is over the top beautiful and you know I love Cameo’s .. GREAT JOB dear friend ..
Irene, I have admired your work before I knew about B’Sue’s Creative Group. I discovered your work on Pinterest. 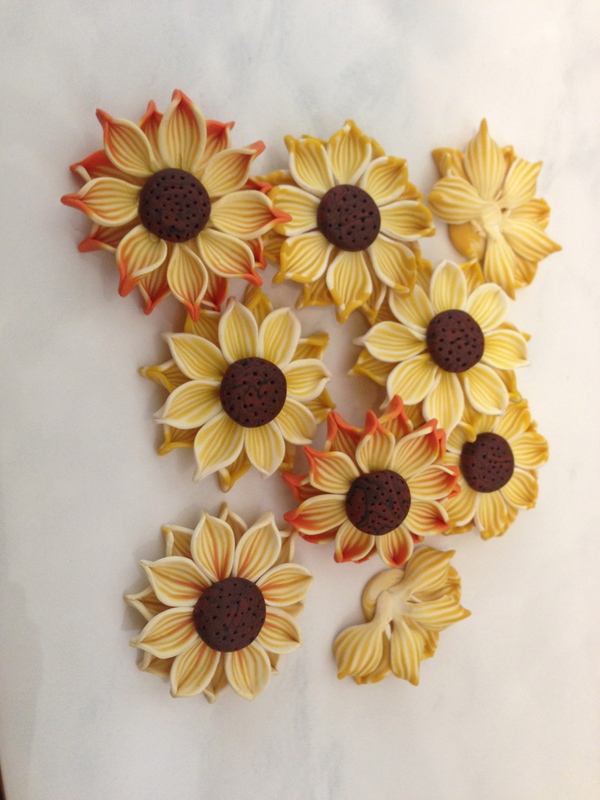 It is hard for me to comprehend that those beautiful flowers are made of clay. I am just beginning to work with clay and I can only hope to be half as good as you. Like I said before, you inspire me. Oh Susan I am honored. Thank you so much. You are going to be a great clay artist. We all start somewhere sometime. 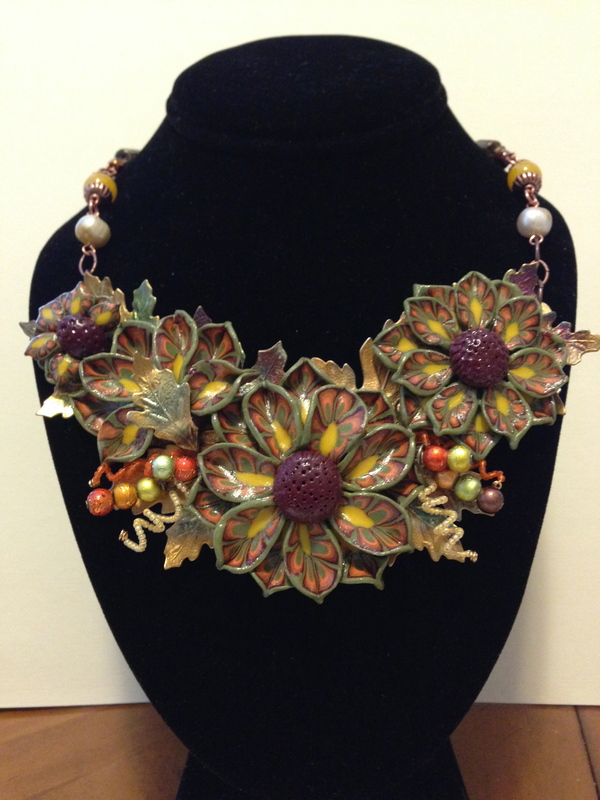 I only started working with clay 2 years ago when I attended the first B’sue Workshop and was taught by Christy Friesen. I took off after that making flower assemblages and I will probably not venture too far from that. I truly enjoy it. That is gorgeous. I didn’t think book chain could be made more dramatic…but you did it. That is so pretty! 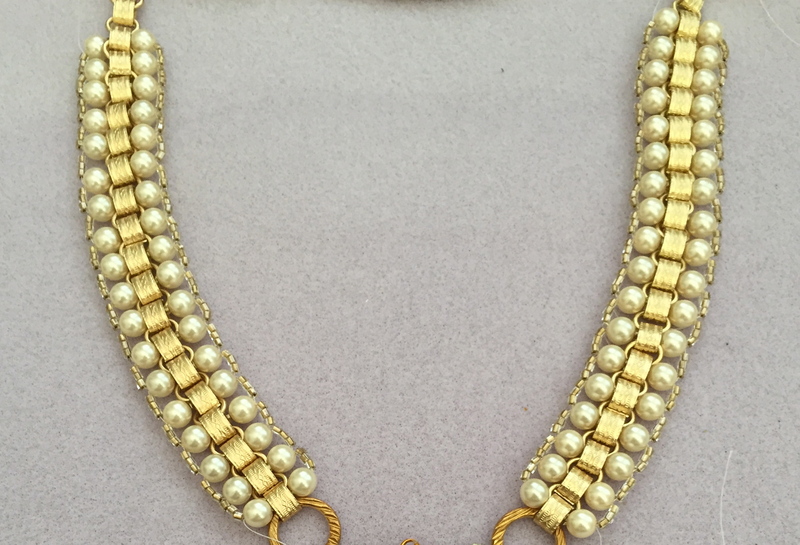 Your chain would make a gorgeous co-ordinating bracelet too, the pearls are just gorgeous with the book chain. I have to say too, Love love love your sunflowers! Irene, you have done such splendid work! Lovely necklace, Irene … the chain is wonderful! Excellent job on it! Your piece is stunning! 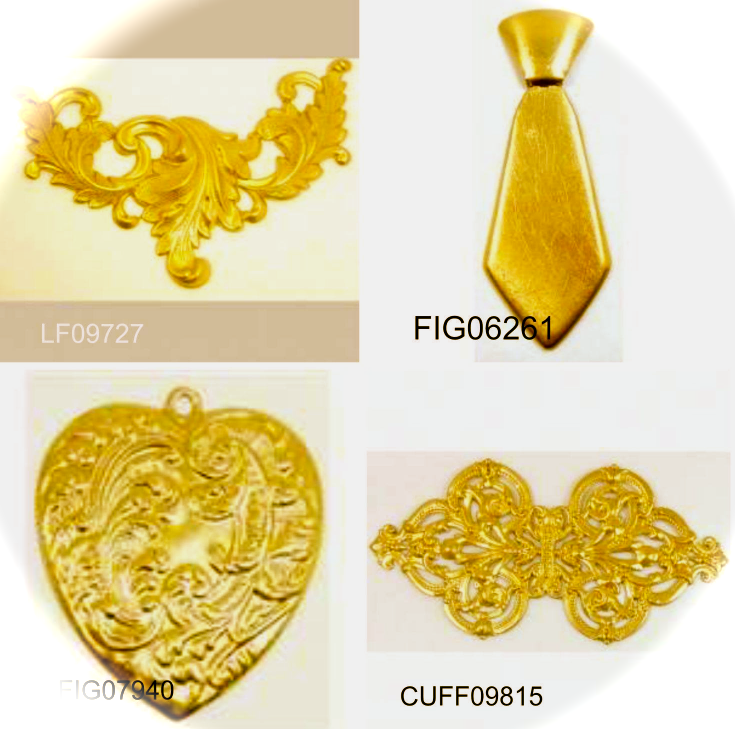 I love the neck chain, it is the perfect compliment to your pendant – your work on that was amazing. Love that you did a choker – I am a huge fan of that length! Your clay pieces are exceptional. The flowers are just beautiful! Thank you so much Chi. I too am a fan of choker length and prefer to wear my necklaces that way. 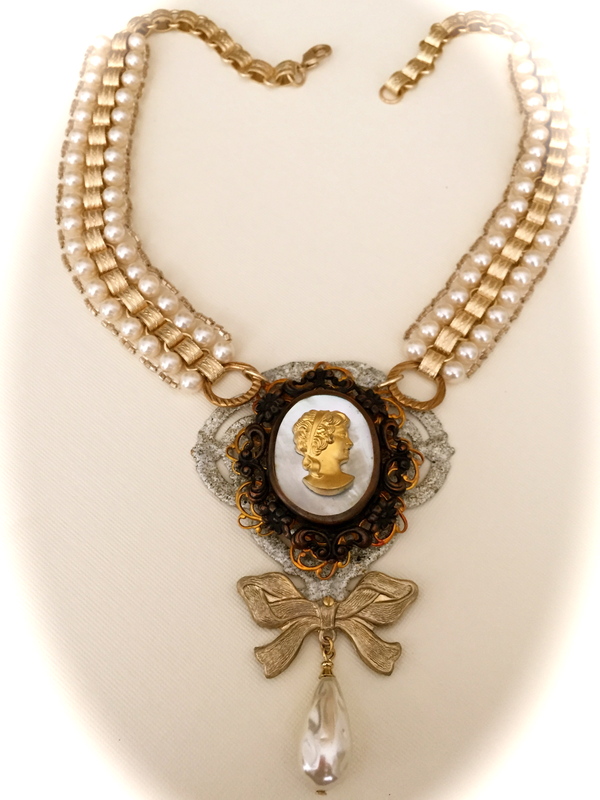 Renie, this is such a beautiful design with the cameo focal. And I absolutely love how you did that book chain for the necklace. Stunning, my friend!! And I can’t even tell you how much I LOVE your polymer creations!! Thank you Marcia. Means a lot dear friend. This necklace is truly lovely, Irene. It looks like a wonderful antique at an auction. Your design is perfect, and perfectly executed. You are extremely talented. I love what you made, and I’m glad you found time to participate in the challenge. Thank you Renee and I’m glad I participated. It brought us together to share in what we love to do. I am in LOVE with the combination of Book Chain and Pearls! Each piece is beautiful Irene! Thank you Kate. Bookchain and pearls, cant talk it up enough. Love the combination too. 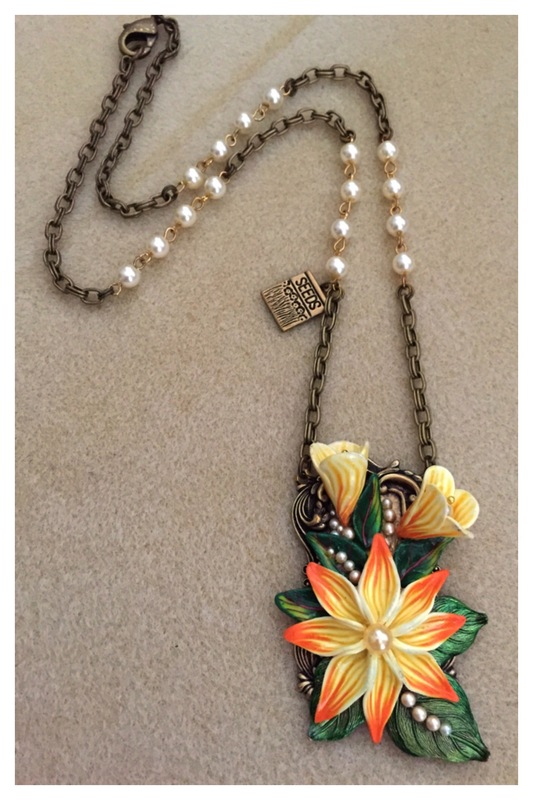 This chain is beyond fabulous! First I love the design very well thought out and vintage looking. Second I would love to learn how to make that chain. I just love it. 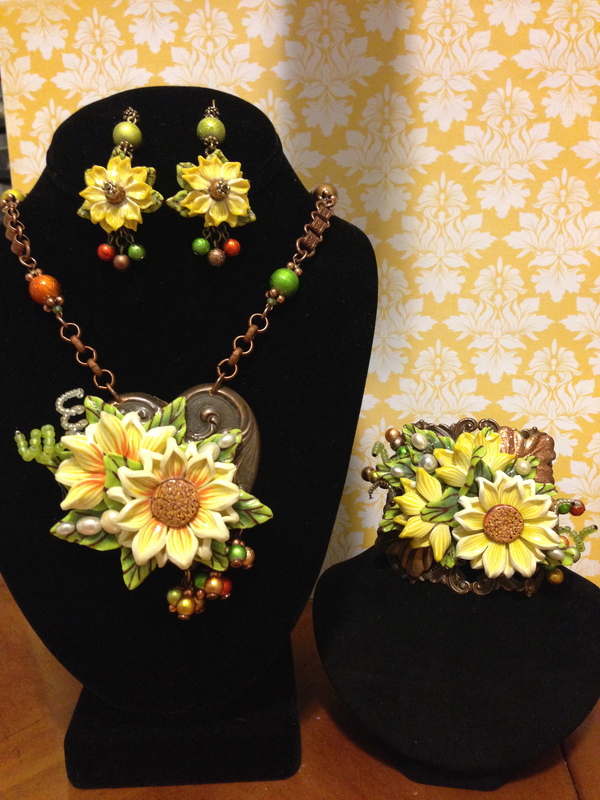 Third I love al of your polymer clay jewelry and the flowers are awesome. And finally your shop looks great and I still love the upside down hearts. They are so cute. Irene, just now reading your blog. Great job with your beautiful piece. The chain is breathtaking! I love your blog! The pictures are so well done. You make beautiful pieces I would love to wear.